This is one of my favorite summer salads. It is in the style of the French Provençal salade niçoise except that I exclude the tuna and tomatoes. 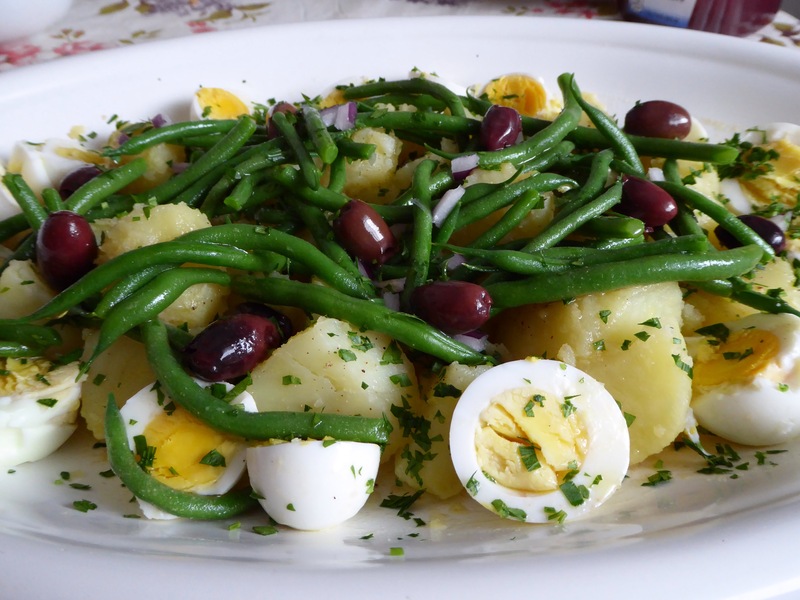 It is made with garden fresh potatoes, green beans, eggs, and olives. You can add some salad greens or red bell peppers if you prefer. It is great on its own for lunch or a light supper. I enjoy this accompanied by a fresh tomato salad with a loaf of crusty bread. Scrub the potatoes but leave the skins on. Place them in a 5-quart pot and fill it with cold water and add 1 tsp. kosher salt. Cover and bring to a boil on medium high heat, then remove cover and continue cooking for about 20 minutes until potatoes are tender when pierced with a knife. Drain and set aside. While potatoes are cooking bring a 2-quart pot full of water to the boil. Add eggs and cook for two minutes. Remove from heat and let eggs sit in boiled water for about 20 minutes, then drain, peel, and cut eggs in half. Sprinkle eggs with a little salt and pepper and set aside. Bring another 2-quart pot full of water to the boil. Add a bit of salt and then beans. Cook for 7 minutes, then drain. Assemble the salad by whisking together the vinaigrette ingredients in order. Peel cooked potatoes and cut into quarters or sixths. Set them in the middle of serving platter and sprinkle with a little salt and pepper. Drizzle potatoes with a couple of Tablespoons of vinaigrette and toss. Place eggs around potatoes and drizzle eggs with a teaspoon or so of vinaigrette. Sprinkle potatoes and eggs with half of the parsley. Toss the cooked green beans with a little vinaigrette, then place on top of potatoes. Sprinkle olives and red onion over beans. Drizzle a bit more vinaigrette on top but save about 1/4 cup for individual portions. Sprinkle with remaining parsley and serve. Serves 4-6.